NORDIC TUGS CALLS THEM NEW BOATS. THE 32+ AND the convertible 37. From the dock, they look the same. 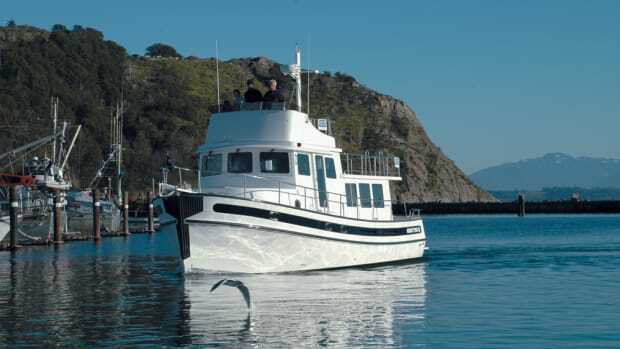 The classic tug-yacht design first introduced by Seattle naval architect Lynn Senour more than 20 years ago hasn&apos;t been altered. The tug-like pilothouse is unchanged and the salty faux smokestack still is there. Dramatic and extensive structural and design changes on the inside, however, make them new and different. Major examples: The 32 Nordic stateroom has been enlarged and now has space for an island berth. On the 37, the guest stateroom has been tossed out to provide additional space for the master stateroom and the head and for a bonus room that can be adapted to fit the buyers&apos; needs. On the first convertible 37, that space contained a washer-dryer combo, a small freezer and storage spaces. The result: boats that are more comfortable and should better serve cruising couples. Change is costly but inevitable in a competitive market. After a long review of its market and after talking with owners and potential buyers and assessing their recommendations for changes and improvements, the Burlington, Washington, company determined a new look was necessary. In a hush-hush operation, engineers and designers went to work, and the new boats were introduced to the public in Seattle in August 2002. Nordic Tugs&apos; 32-foot yacht has been on the market since 1985, long enough to be considered venerable. There have been minor design improvements over the years, but the boat has remained relatively unchanged. Creating the 32+ required pushing the engine 18 inches farther aft, a move made possible by the decision a couple of years ago to incorporate the boarding platform in the molded hull. The 32 now has a waterline length of 32 feet 7 inches, and moving the engine posed no balance problems. That extra space enlarges the forward stateroom sufficiently to permit installation of an island berth (replacing V-berths) and expansion of the head to include a separate shower space. The helm station moved aft slightly, requiring changes in door and window alignments. Because the overall length of the boat remained the same, something had to give, and the saloon area is about 1 foot shorter. As it added space, Nordic Tugs also added spice. The 220-horsepower Cummins diesel that long had powered the 32 was pumped to 270hp on the 32+. A VacuFlush toilet was added to the head, and the helm received space for flushmounted equipment, a layout previously available only on larger boats. Engine controls were upgraded with installation of a singlehandle Morse KE4 electronic shift/throttle. 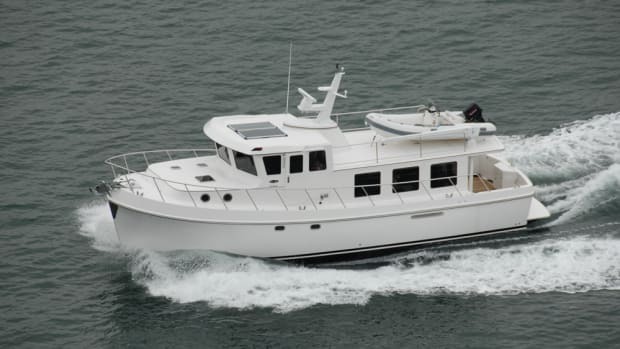 Other features that once were options have become standard items, including a Lofrans Tigress windlass, seawater washdowns fore and aft, stainless steel rails around the sundeck, a Fireboy system with automatic engine shutdown and pantograph-style windshield wipers. Ultrasuede upholstery now is standard on the 32, as is a ventilating hatch in the pilothouse roof. All Nordic Tugs will be fitted for the climates in which they will operate. Those built for cooler northern regions will come equipped with multiple heating systems: Heater Craft units, using engine heat; an Espar forced-air furnace; and built-in electric heaters. 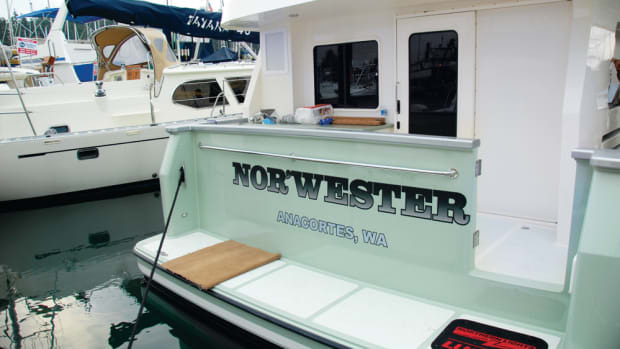 Northern boats have propane galley stoves. All-climate yachts (that means hot weather) have a five-kilowatt generator, two air-conditioning units and an electric galley stove. For the first time, a 32 Nordic will be equipped with a generator. Jim Cress, president of Nordic Tugs, offered a preview of the 32+ and the convertible 37 for boating writers just before the two models were introduced to the boating public. 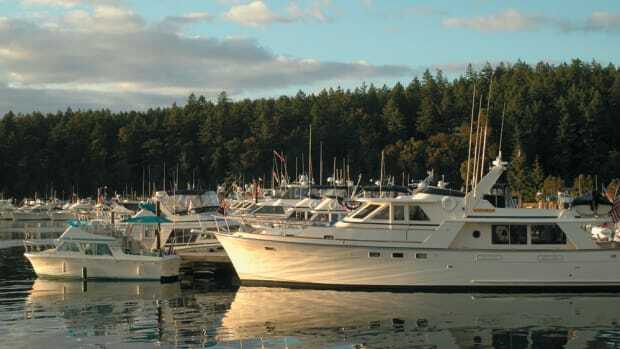 "They are new boats," Cress told the writers in a gathering in Anacortes, Washington. "When the 32 was introduced it was expected that it would be a limited production boat. But by 1989 the 32 represented 50 percent of our sales (the other half was 26-footers that no longer are built), and by 1994 it represented 90 percent of our sales. "We didn&apos;t change it. The 32 never was broken; it always worked very well," Cress said. But the market changed. Boaters wanted island berths and other improvements, and the first extensive redesign of the 32 began. The limiting factor was the forward engineroom bulkhead. Engineers determined it could be moved, and an array of interior design revisions followed. "The boat has better trim and performance now," Cress says. "It gives us a much more marketable product. And we get better speed, too." It was immediately popular, with more than 70 launched since its introduction. It always offered two staterooms, for cruising by families or two couples, and the two-stateroom model continues to be available. There was a demand, however, for a roomier single stateroom. On the optional convertible 37, the master stateroom has 58 percent more floor space, and there&apos;s 83 percent more floor space in the shower. "That&apos;s a significant difference," Cress says. The bonus space, on the port side opposite the head, could be a day head, a huge hanging locker, an office or a utility room. The 37&apos;s roof was extended over the cockpit to provide a lounging area better protected from the weather. "It&apos;s the same 37-foot boat," Cress adds. "But it is a new product." Cress, members of his staff and the working press boarded the boats in Cap Sante Marina in Anacortes, not far from the Nordic plant. We took them through Guemes Channel and along Rosario Strait but found only light breezes in what are often turbulent waters. The 32+, with its 270hp engine, is a hot boat. Aided by strong currents in Guemes Channel, she zoomed along at 18 to 19 knots-at wide-open throttle, of course. Noise levels were acceptable- 74 decibels at a comfortable cruising speed of 2000 rpm and 10.6 knots. At 2600 rpm and 16.4 knots sound levels reached an annoying 82 decibels, but there&apos;s little reason to run that fast, so it&apos;s not much of a problem. There was no sound meter on the 37, but it was obviously quieter despite her 330hp engine. Compared to the 32+, the 37 has a spacious engine room, and the pilothouse deck is farther from the top of the Cummins diesel. It&apos;s believed that spaciousness reduces the amount of noise energy reaching living spaces. With its hard chines, the 32+ was unaffected by a confused mix of small swells and vessel wakes in Guemes Channel. There was little rolling. Her bow split many swells and tossed spray far and wide. But the Senour design kept the windscreen dry. While others drove, I prowled through the 32, moving from galley to pilothouse to the forward stateroom. The island berth, I decided, would accommodate average-sized people. Big people (6&apos; 5" and 275 pounds, for example) probably would fit better in the optional V-berths. The 32 stateroom has a single hanging locker and drawers for storage. The spaces are not voluminous but are sufficient for those who pack carefully. On the convertible 37, you&apos;ll find his-and-her hanging lockers and additional drawers and shelving in the stateroom. The enlarged head on the 32+ is almost opulent. While many heads are dark and gloomy, this one is white and bright and cheerful. It&apos;s possible to turn without banging elbows. Later, aboard the convertible 37, I was impressed with the spaciousness of the master stateroom and of the head. It was opulence plus. I know scores of boaters who would do nearly anything to have the 37 bonus room, with space for a small freezer, a combo washerdryer and cupboards, too. The 32+, rigged for northern climates, has a base price of $243,100; the convertible 37 is priced at $358,000. The Nordic Tugs built in the early 1980s featured laminated plastic paneling that looked like teak, and some had wood stoves in the pilothouse and oil stoves in the galley. What a difference today&apos;s boats offer, with Ultrasuede upholstery, hand-rubbed oiled teak paneling and furniture, a teak-and-holly sole in the pilothouse, Corian countertops and built-in heating systems. We&apos;ll see how Nordic Tugs does with the new models. The spiffed-up boats should be terrific competitors in the national boating market. But I know already that someone in the company does great long-distance weather forecasting. August in the Anacortes area was unusually foggy, with a cool blanket of vapor often hanging on until midafternoon. On the days without fog, one expected, and usually experienced, wind. Nordic Tugs chose the sea trial date weeks earlier, and was rewarded with good weather- no fog, no wind.